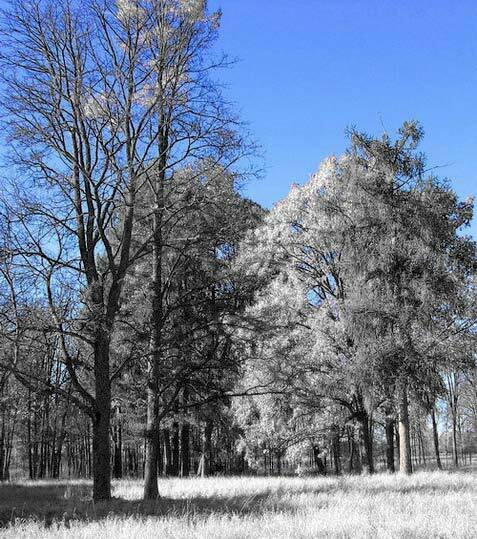 Convert your photo into very unusual, infrared-like image with extreme colors. You will learn very effective sky extraction technique, use channels and curves to produce grayscale image which will look like infrared photography, use mask to isolate part of the image and create several layers with blending mode set to ‘color’ to control parts of the image independently. ‘Setting up’ the image takes several minutes. Once you created all necessary layers it becomes very easy to alter the colors to achieve quite unusual or even ‘crazy’ color effects. All Photoshop keyboard shortcuts are for PC. I don’t have a Mac, but as far as I know the main difference is use of the COMMAND key and OPTION key on a Mac instead of the CTRL key and the ALT key on a PC. Click to enlarge. The workflow. Duplicate the background by pressing CTRL-J. 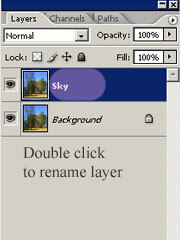 The copy of the ‘Background’ layer will be created with default name ‘Layer 1’. Rename it to ‘Sky’ (by double-clicking ‘Layer 1’ in the layer palette). should be active. Go to channels. Select blue channel. Each channel shows the amount of red, green or blue color in the image. Look at the blue channel. Dark areas indicate little amount of blue color in the composited image, and white areas ‘mean’ large amount of blue. Fortunately sky in our image is ‘very’ blue. It means that the sky in the blue channel is nearly white – and it makes creating selection for the sky VERY easy. 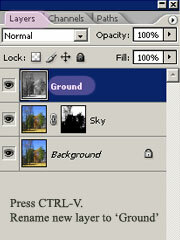 Select-Color Range settings Create selection for the sky. 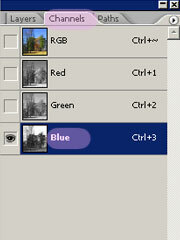 Select – Color Range – Highlights (the blue channel MUST be active). To make selection a bit smoother use Select – Feather and set Feather Radius to 1 pixel. IMPORTANT. Before continuing switch back to RGB (click ‘RGB’ in the Channels palette). Your image should become colored again. ‘Sky’ layer with mask applied. Create mask from the selection. Go back to the Layers palette. 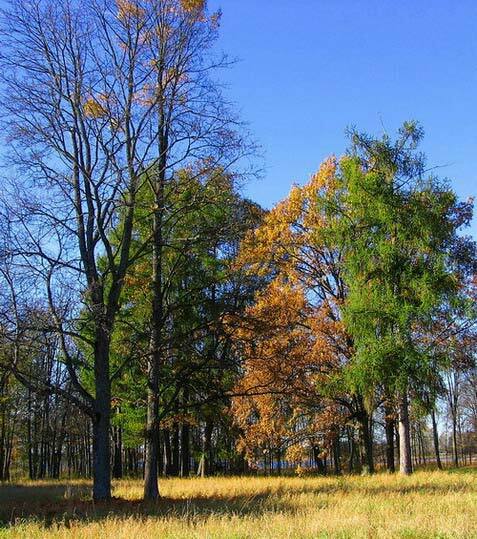 Select Layer – Layer Mask – Reveal selection. It will hide everything on the Sky layer except the sky itself. Mask thumbnail should appear near the Sky layer name. 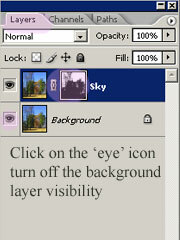 Click on the ‘eye’ icon next to the ‘Background’ layer to hide the background. Have a look at the masked Sky layer only. Then turn visibility of the ‘Background’ on. of the Red channel. Find the most detailed channel and copy it’s contents. IMPORTANT. Make ‘Background’ layer active. Go to the Channels palette. Examine each of the three channels to find most detailed one (usually it is red channel). Make Red channel active. Press CTRL-A to select it and then CTRL-C to copy all the contents of the Red channel. created from the Red channel. Paste contents of Red channel as a new layer. IMPORTANT. Return to RGB (click RGB thumbnail in the Channels palette). Go back to the Layers palette. 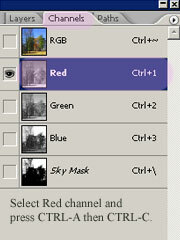 Press CTRL-V to paste contents of the red channel as a new layer. 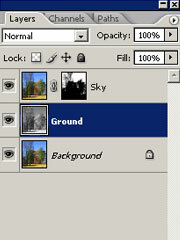 Rename created layer to ‘Ground’. Click to see the image so far. 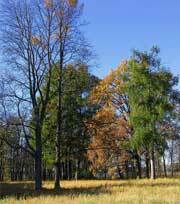 Place the ‘Ground’ layer under the ‘Sky’. Press CTRL-[ to move ‘Ground’ layer down in the layer stack. 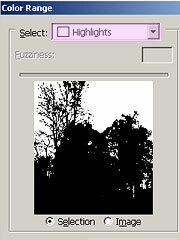 Now we have grayscale photo with colored sky. Click on the image to see our result so far. The preparation part of infrared photography tutorial is over. Go to the second part of it.